GMM's new Kirov set is designed to be exceptionally user-friendly, especially concerning the design and assembly of the extremely complex Russian radars and yardarm assemblies. A minimal parts count combined with a reduced need to glue parts together and GMM's unique "tab-and-slot" construction results in a beautifully detailed collection of fittings that most modelers will be able to handle. Our careful usage of actual Russian drawings of the Kirov and close-up photos of Russian naval radars and other items makes this the most technically accurate PE detail set ever released for this class of ship. The set supplies highly accurate replicas of all air search, surface search, and fire control radars carried by various ships of this class including the Top Pair, Top Steer, Top Plate, and Plate Steer radars. Also included are three Palm Frond radars, two sets of Strut Pair radars, two pairs of Cross Sword radar antennas, replacement Pop Group radar antennas, and assorted ECM and direction finding antennas. Additional items provided include deployed and folded helicopter rotors for two Kamov helicopters, details for the ship's boats, correctly configured helicopter landing pad net & safety nets, a highly detailed missile loading crane, replacement one-piece fold-to-shape yardarm, replacement fold-to-shape Vee-Tube antenna mast & sensors, replacement platforms for ECM antennas, an Aft Light assembly, correctly configured five-blade ship's screws, rigging and hooks for the two ship's cranes, accommodation ladders, vertical & inclined ladders, and dedicated Russian-design railing complete with accurate turnbuckle detailing where required. 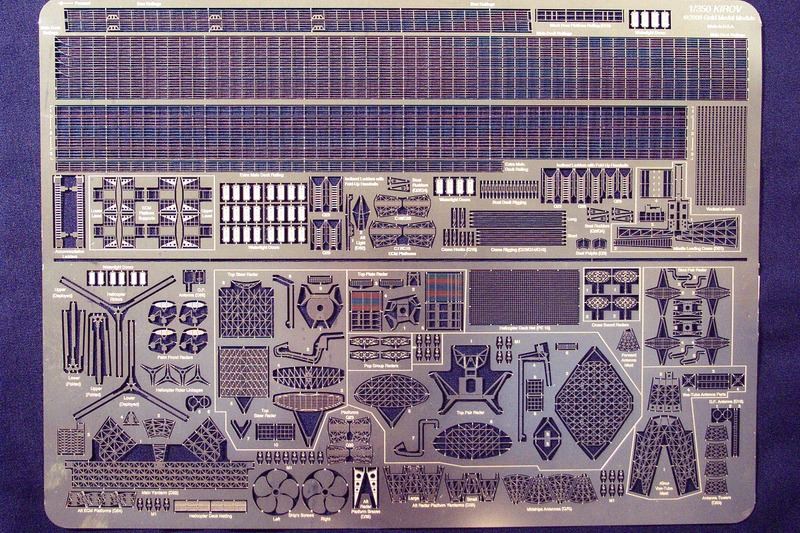 This set will allow a modeler to configure the Trumpeter kit into any version of the Russian Kirov-class battlecruisers. It also features extensive 3-D relief etching in .005" brass for extra detail as well as extra fine railings and antennas. SEE PHOTOS AND A REVIEW OF GMM'S 1/350 SCALE KIROV SET!